One of the things I like to say about TRwBB is that it is oh. so. simple. In a word, it’s gimmick-free. And then I hear the rumblings about how maybe this isn’t enough. Isn’t it better to do lots of activities? Don’t I need printables? Matching activities? Coloring sheets? Games? Before I go on, I want to say that if you do these things, I don’t condemn you. I’m not saying there is anything wrong with fun activities. If you want to add that sort of thing, just search around on the internet, and you’ll find lots of options. But here at TRwBB, my goal has been to simply teach reading. Or maybe it is to teach reading simply. Either way, I’ve cut out all gimmicks and distractions and focused on the pure, necessary instruction. This isn’t to say that you can’t go and play word games or whatever with your child, but only that that is not what this site aims to do. 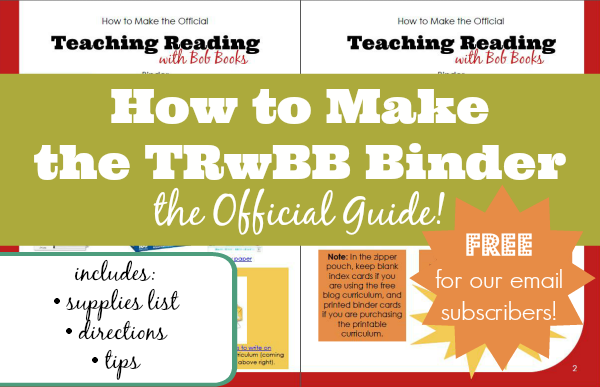 TRwBB aims at that little space in your day where reading muscles are grown—the key ten to fifteen minutes of instruction that can change a child’s life. When I had only one little guy that I was teaching, I had time for all the ruckus. I am not a Fun Mom by any stretch of the imagination, but still, if he wanted to spend thirty minutes on related activities, I was up for it. It was just the two of us, with perhaps a baby or two sleeping somewhere in the house. These days, I have a bustling house full of students. I’m not just teaching phonics, I’m teaching Latin and How to Divide Fractions. I’m bouncing from first grade math to third grade copywork to piano and back to — hey! did I say you could go outside? It’s so much fun, and I’m thankful to be able to do it. But the truth is that, though I’ve always treated learning to read with simplicity, these days simplicity is necessary. You know what is not necessary? It is fine if you enjoy it, but again: that is not what TRwBB is about. To be honest, I’d rather get the reading lessons over and done with and move on with our day. Let’s do a nature walk. Let’s sing a worthy song. Let’s read a great book aloud. So saying that we’re gimmick-free means that we’ve pared this down to what is needful, and nothing more. Learning to read can be a big, huge project, and that’s okay…if you want it that way. But around here you have permission to just get it done, and then do something you find more interesting. And that, my friends, is why Teaching Reading with Bob Books is proud to be gimmick-free.